This "Historically Speaking" column appeared in the Exeter News-Letter on Friday, January 31, 2014. On a Sunday afternoon in June of 1861, Hannah Brown of Exeter summed up the economic life of the town in her diary, “Things go on the same as ever, business dull as ever, very little work to be done, the war puts a stagnation on everything. If the war continues until winter it will be so hard for poor folks. I don’t know what will become of them.” Hannah herself was hardly wealthy – she eked out a living with dressmaking and invalid care – but she was right to be concerned about the well-being of her fellow townsfolk. The Exeter Manufacturing Company, the cotton textile mill in the downtown, was virtually shut down during the war, only managing to squeeze out one-third of its pre-war production levels by the very end of the war. Former employees had to migrate to other towns with other factories to find work. Uncertainty in the future tended to slow even household improvements – sending a bevy of painters, carpenters and day laborers out of work. At the conclusion of the war, Exeter, like most New England towns, was ready to get back to work. And, like most New England towns, a host of new industries and businesses began to flourish during a period stretching from 1870 – 1900, sometimes called the ‘second industrial revolution.’ The northern states came out of the war with infrastructure intact. All that was needed was a renewed workforce and an injection of capital to pull the economy out of the doldrums. In the years just after the war, heavy industry developed near the railroad depot. Exeter Machine Works manufactured heavy boilers, radiators, blowers and exhaust systems. Many of the older homes in Exeter still have radiators embossed with the name “Exeter Machine Works” on the fins. The business incorporated in 1876 at a time when central heating systems were still considered a luxury. Nearly on the same spot was the Exeter Brass Works. With a workforce of sixty people, Eben Folsom and Joseph Wiggin incorporated the business in 1892. Turning out high-quality fittings for water, gas and steam, the foundry also produced some fancy goods. Brass candlesticks bearing the Exeter Brass Works logo can still be found in estate auctions throughout New England. Production methods used during the war created an entirely new way of creating goods. Assembly line production and mass produced items changed the purchasing habits of the population. Instead of having a pair of shoes made by a cobbler, one might be able to walk into a shop and buy a pair ready-made at a shop. The Exeter Boot and Shoe Company was founded on Front Street in 1882 and by 1911 was producing 125 sixty pair cases of women’s shoes per day. But the factories and machine shops weren’t the only change in the local economy. In the business district of town, down by the river, new stores advertised a wide variety of consumer goods in the late 1800s. A small booklet entitled, “Exeter. Resources, Development and Progress, A Series of Comprehensive Sketches” published in 1902 was a veritable booster for the downtown merchants. “Capital and business enterprises have given Exeter good stores and stocks of merchandise and other essentials being rich and varied and, as freight rates are comparatively low, prices are quoted accordingly, so that people from the surrounding districts come here to buy. The business men are so fully alive and attentive to the wants of the community, that there is no necessity for going outside to get anything, for here everything that can be required for a family can be had, of the latest make and at prices which compare favorably with those ruling in the great metropolitan centers.” No need to take the train to Boston, Exeter had everything you could want right here. Our consumer economy, it seems, has its roots in the Gilded Age. We appreciate one-stop shopping as much as our predecessors. Is it any wonder, then, that we can pick up a rice cooker at the drug store or oatmeal at the gas station? 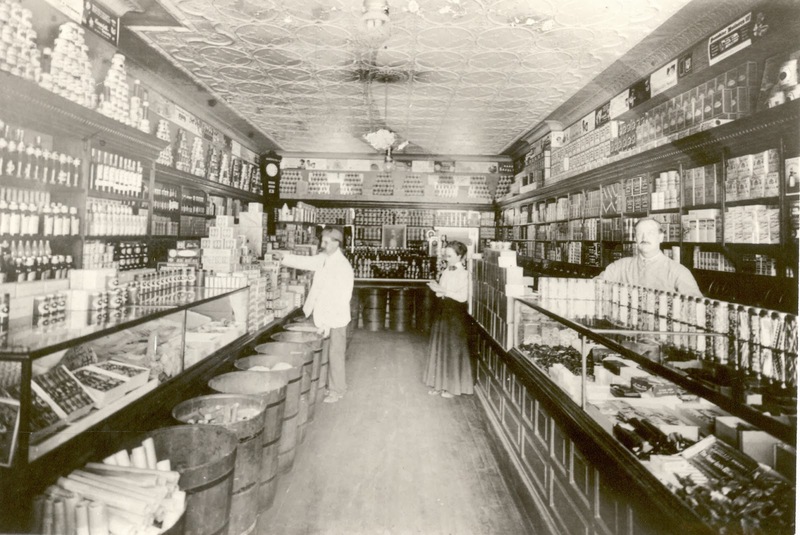 Photo: This well-stocked Exeter shop on Water Street from about 1906 offered a wide variety of goods to shoppers. The consumer economy as we know it today developed in the years following the Civil War.